This 5 day, no pressure, fun course is designed for competent sailors (RYA Competent crew level and above) to learn the intricacies of advanced sail trim and the setting and use of storm sails, asymmetric and symmetric spinnakers. We will also be focusing on emergency procedures such as man overboard and engine / power failure as well as power handling in marinas. During this exciting, no pressure week we will, as usual visit some of our regular haunts in Morocco and Spain and will spend each evening in a marina to avail ourselves of shore side facilities. Each day however we will learn new procedures with the ultimate aim of being safe and competent in emergency situations and also to have a sound working knowledge of sail trim. 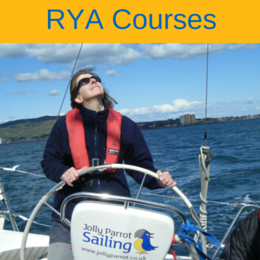 This course is designed and run by Jolly Parrot Sailing by popular demand to bridge some of the gaps in the formal RYA Cruising programme. 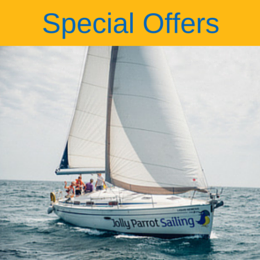 As such it is ideal for sailors looking to move on to skipper longer passages or to participate in races and for those looking to gain RYA Coastal Skipper and the esteemed RYA Yachtmaster qualification. Your instructor for the week will be a highly experienced Yachtmaster Instructor. Symmetric Spinnaker: Packing,hoisting,gybing and dropping. Power handling in confined spaces. With your new found skills you will be perfectly positioned to skipper a yacht for a family holiday or possibly to sign up for your first race where you can demonstrate your knowledge of sail trim and spinnaker work.You may even be ready to sign up for our RYA Coastal Skipper Practical or RYA Coastal Skipper Combined courses.